Porto Lounge’s prime location in the heart of the city’s nightlife scene makes it one of the best places to have fun. Stay with us and we’ll offer you the best possible stay in one of the most picturesque cities in Europe. Porto Lounge Hostel & Guesthouse is a completely restored and modernized building that combines the original typical architecture from the XIX century with a very stylish and modern interior which offers a chic accommodation. 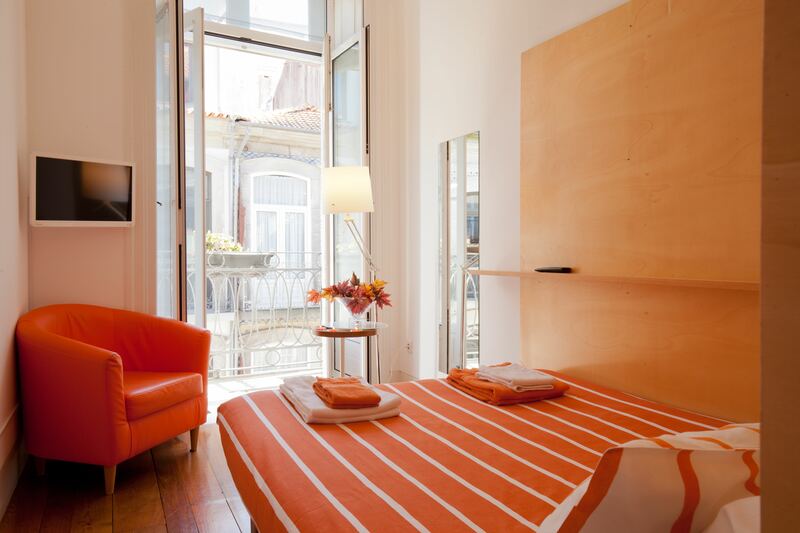 We are situated in a typical XVIII century street in the heart of the historic centre of Porto, close to the most important city square – Avenida dos Aliados – where you can find Porto’s most important attractions and enjoy the city’s great nightlife. Monuments, cafés, esplanades, bars, discos, nightclubs, restaurants, shops and tourist information spots are all within a short walking distance, as well as the main train station (S. Bento) and the central metro station (Trindade). In our hostel we welcome travellers of all ages from all over the world. Families are welcome too. We have mixed dormitories, a girl’s dormitory, but also private rooms with en suite facilities suitable for couples and families. We have also good conditions for groups. Rooms with 8 or 10 beds and ensuite bathroom, ideal for young people travelling alone or with friends and looking for a budget accommodation. Every room has a double bed, a bathroom and a toilet shared by two rooms only. The bathroom has two showers and two washbasins. The toilet has a washbasin and wc. Ideal for 1 person or for a couple. A room consisting of three single beds and the possibility of one extra bed and ensuite bathroom. There’s a balcony overviewing the terrace. Ideal for 2-4 friends or for a family. Any question you have, we will be happy to answer. Email us and we will write you back shortly. We are located in the very heart of the City of Porto.